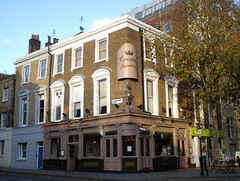 Nice pub on Clerkenwell Green, though it's perhaps best experienced at off-peak times, such as weekday afternoons. It's a Castle Mitchells & Butlers pub, and shares similarities with a number of other examples of the breed, such as the Ranelagh in Bounds Green — real ciders and continental lagers in addition to a couple of real ales, plus a menu which is uniform between the pubs but offers food which is more interesting than average (though the prices also tend to be a little higher than average). The front part of the Crown has large windows to let the light in. There's also quite a bit of seating outside in the square, though it isn't covered. There's a nice cosy back room photo with sofa banquettes, low tables, and backless padded stools — though on Kake's August 2008 visit it also had annoyingly noisy aircon. Kake first visited on a Wednesday afternoon in August 2008. There were four handpumps in action, offering Westons Cider (3.15/pint), Adnams Bitter, London Pride, and Landlord. They also had Aspalls cider, as well as Fruli and some kind of peach beer in bottles, and apparently they also have many interesting lagers (see Stonch's review, linked below). I also noted interesting gins behind the bar; Tanqueray, Hendricks, and Bombay Sapphire. Newspapers and a Scrabble set were laid out on a table in the front part of the pub. The place wasn't too crowded, and wasn't echoingly empty either. However, on a second visit on a Thursday evening in September 2008, the place was packed, noisy, and not entirely pleasant. The upstairs room was similarly packed, and pretty warm and airless, despite the ceiling fans. The lights were turned right the way down and the music turned up. It seems this pub is best experienced at off-peak times. As of August 2008, the food hours are noon-10pm Mon-Thu; noon-11pm Fri-Sat; and noon-9:30pm Sun. The menu photo is the same as the one at the Ranelagh, but with prices up to a pound more expensive, probably due to its more central location. On Kake's first visit in August 2008, I tried the devilled whitebait (£4.50) photo, which were just fine, if a little lacking in chilli heat; no greasier than they needed to be, not overly fishy-tasting, and good and fleshy with no sign of bones. The deep-fried parsley that came on the side was fine too. I'd order these again. On my second visit in September 2008 I had the lamb chops with roasted new potatoes (£8.90); again, the quality was good, with the chops cooked slightly pink, moist, and tender. I would very happily eat here again. As of August 2008, they have a special offer on Mondays where almost all bottles of wine are £10. The upstairs room (the "Apollo Lounge") is bookable, and (as of August 2008) they usually charge a flat fee of £100 for this, though if you're willing to guarantee a decent bar take they may negotiate. You can also book tables in the downstairs part. However, the booking that Kake made for the September 2008 London Perlmongers social meet got rather messed up; we were promised the whole of the upstairs room but somehow this got mangled into a couple of tables in the back room. Since we're a large group who like to mingle, this wasn't adequate and so we're unlikely to risk booking here again. Accessibility: Gents' toilets are up a shallow step, ladies' are up a flight of stairs with a handrail and two bends. Last visited by Kake, ilmari, Nick, and other Perlmongers, 4 September 2008. Opening hours taken from website, June 2009. Last edited 2014-12-10 17:17:53 (version 18; diff). List all versions. Page last edited 2014-12-10 17:17:53 (version 18).